It's such a lovely thing to enjoy the first book of a series lots (here's my review of Love Sugar Magic: A Dash of Trouble) and then to read the second book and not just enjoy it but love it! 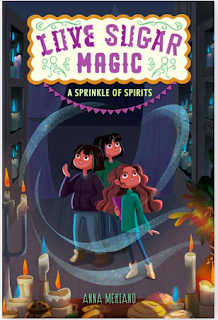 A Sprinkle of Sprits (Walden Pond, Feb. 5 2019) continues the story of Leo, a girl whose family runs a magical bakery in a small Texas town, who longs to learn all she can about magic, even though her family thinks she's too young. The oldest two of her four big sisters are also unencouraging about her friend Caroline; they don't think that magical folk should share too much with ordinary people. Leo feels pressured to chose between friendship and magic, and she's knows she has responsibilities to the bakery...and now Caroline's feelings are badly hurt. When Leo wakes up to find her abuela, dead for years, visiting her in very corporal form, she's sure that this time it isn't her fault. Other spirits are popping up around town as well, and if it isn't Leo's magic at work, whose is it, and how can it be reversed? The answer is unexpected, and a lovely surprise! The six spirits all have their own agendas and unfinished business, and thought it becomes clear that they need to be sent back before they fade into nothingness, they aren't easily corralled. Leo gets her family's permission to call on her friends to help, and a wild ghost chase ensues. And finally, in the end, peace returns for both the living and the dead, and Leo finds out what her own particular magical gift is. A Dash of Trouble is primarily about things going awfully wrong, so it was fun, but not desperately relaxing. Things go wrong here too, but the point of the book is not magical mistakes, but family, communication, trust, and obligations, so it was a much warmer read! I loved the spirits, each with their own concerns (they were sweetly mundane concerns--checking on family, garden, piano, and town...), and loved how Leo and Caroline's friendship survives its test to become stronger. Leo becomes more empathetic, as well as more magical; she's much more likeable in this one! And there are still all the warm, delicious treats being baked in the family business, sweeting the story even further. For more Anna Meriano goodness, including giveaways, visit the other blog tour stops! And finally, Anna Meriano will be here in Rhode Island in March for Kidlitcon Providence, talking about magic in the real world and signing books!